Steel making by melting various grades of good scrap, hot briquetted iron, Iron ore and pig iron and refining the same in electric arc furnace is adopted in SAIL-SCL. 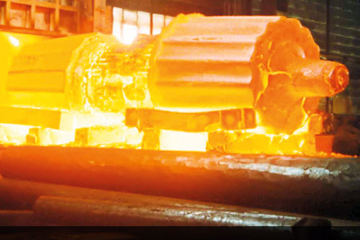 The company has three electric arc furnaces of 10/12T capacity each and a twin-strand continuous casting machine designed by Concast-AG, Zurich. Besides these, the company has various auxiliary equipments like 25/5T EOT Cranes, Water Treatment Plant, 110/11KV substation, full-fledged metallurgical laboratory, etc. The steel produced here is strictly conforming to BIS Specification falling under Mild, Medium Carbon and Spring Steel qualities and is cast into 100mm sq. Billets. The billets are further rolled and converted in to constructional steel of various sections at rolling mills and marketed by SAIL-SCL. Being a holder of 'A' grade BIS License, the Company is authorized to issue certificate conforming to BIS specifications.